I kinda love Spiller Park Coffee. The cheesy baseball theme, the friendly faces, the rockin’ toasts, and, of course, the excellent coffee and espresso. And now there’s more to love. Spiller Park just opened its second outpost in the mid-renovation Toco Hills shopping-mega-corner at LaVista and North Druid Hills, joining the Ponce City Market location in what may become a hometown hero coffee chain. Owner/partners Hugh Acheson and Dale Donchey tell me there are plans in the works to bring even more Spiller Parks to the fine people of Atlanta over the next few years. I ain’t complaining. I visited the new Spiller Park last week as they continued their soft opening, still waiting on new menus, still yet to roll out some new bells and whistles. Sure enough though, the baseball theme was present, the friendly faces were smiling, the toast was rockin’, and the coffee was excellent. Not surprising. 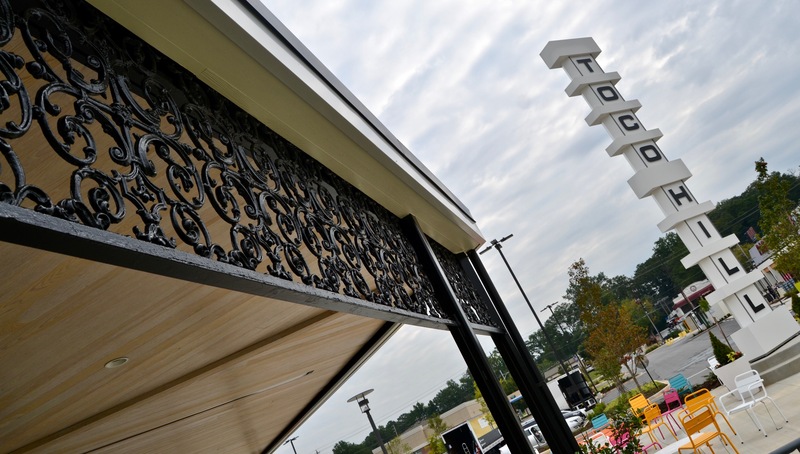 What did surprise me was how fantastic Spiller Park’s little corner of Toco Hill is – thanks in part to an awesomely retro shopping center sign and the brilliant decision by someone to keep up the ornamental metal (awning? overhang?) on the stretch of shops right next to Spiller Park (you can just make it out in the photo above, or bask in its glory in closer-up photos below). Here are six things (and a few more photos) to get you to over to Toco Hill for your coffee and toast. 2. Baseball mitt koozies. And hot coffee. “We’ll be running different single origin coffees out of each space [Ponce City Market and Toco Hill],” says Donchey, “as well as a siphon brewing option. I liked the idea of being able to put both Spiller Parks on a coffee crawl and walk away with different drinking experiences.” This past week, there were several varieties from both George Howell Coffee and Intelligentsia, but they will be rotating in other roasters as well. 3. Vintage accessories. As I grabbed some sugar, I talked to a random guy about Stanley thermos styles for way too long. This one wasn’t sufficiently vintage for him, but plenty good by me. 4. Rainbow bright chairs and plentiful daylight. It’s nice to sit outside, isn’t it? Even on the somewhat dreary, post-Irma, still-no-power day this shot was taken. 5. Baseball cards. Lots of baseball cards. Did you know Spiller Park (AKA Ponce de Leon Park, AKA Spiller Field) was the home field for the Atlanta minor league baseball team for most of the 20th century? Now you know. 6. Those awesome ornamental metal touches. The camera loves them. 2929 N. Druid Hills Rd. 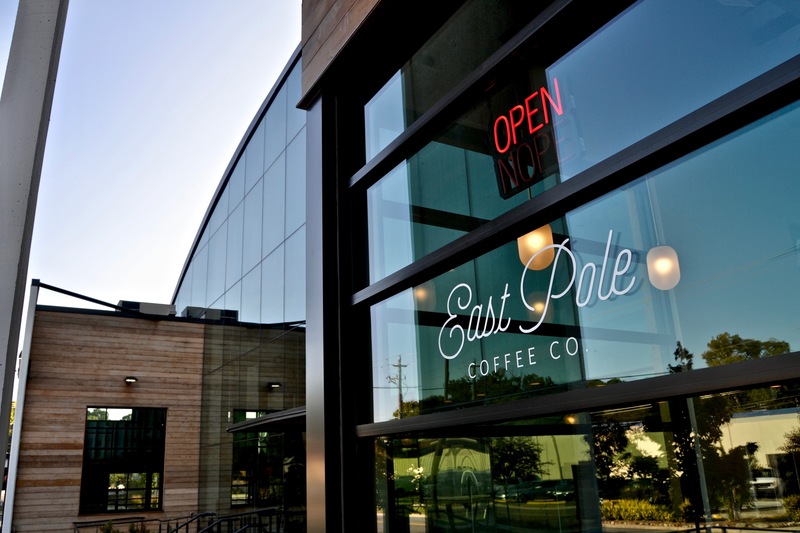 East Pole Coffee Co. is now open for business with their new Atlanta coffee bar and roastery. They soft opened this week, with an official opening next week. Here are six things (and a few more photos) to get you to cross under the Buford Spring connector to Ottley Drive for your morning (or afternoon) coffee. Thing 1: The Ottley Drive – Armour Drive loop is now becoming a thriving drinks hot spot for Atlanta – with East Pole joining next-door neighbor SweetWater Brewing and friends ASW Distillery down the street to provide a beer-whiskey-coffee trifecta to make Atlanta proud. Thing 2: East Pole gets design, which is clear from their packaging and their coffee bar. East Pole’s lovely shop fits perfectly with the industrial-chic architecture of the new Armour Yards campus surrounding it, managing to feel both new and lived-in at the same time. Thing 3: East Pole churns out some excellent coffee beans. They focus on single origin roasts, which will keep you coming back for more to see what’s on the list, whether you’re in the mood for espresso, drip, or a pourover. You can get them by the bag here (as well as places like Taproom down in Kirkwood). Thing 5: East Pole loves being Atlanta-centric, and the “Atlanta” window design is bound to earn some Instagram glory (there’s an especially cool reflection of the window cut-out if you sit in just the right spot in the cafe and look at the reflection in the roastery room glass). Thing 6: If you come on the right day, you just might find the folks behind the counter rocking matching jeans jackets. Just saying. If you live in Atlanta and give a hoot about coffee, you’ve surely heard the news: Revelator has bought Octane. It’s a shock, but not a surprise. Octane was a pioneer in Atlanta’s coffee scene and has steadily grown over the past dozen years, expanding from the west side, to Grant Park, to Buckhead, to midtown, not to mention two shops in Birmingham. They have developed and nurtured a loyal community of fans despite an onslaught of competitors both big and small, most of whom arrived after Octane proved the market was ready for quality coffee. Which is why it’s easy to see that Octane is an attractive acquisition target. They’ve got a strong presence in the Southeast’s leading market, and admirable know-how in terms of operating both the retail and roasting sides of the coffee business. More importantly, Octane owns something that coffee companies dream of – a powerful brand. Revelator? Not so much. If you’re scratching your head and wondering how Revelator managed to buy out Atlanta’s leading craft coffee purveyor, you’re not alone. But the simple fact is – Revelator has money, fueled by a California-based venture capital firm that seems bent on aggressive growth. Octane is owned primarily by Diane and Tony Riffel, the couple that started the company those many moons ago. And behemoths buying up craft coffee companies is not a new thing. The most prominent proponent of the approach is privately held JAB Holding Company – the money that has scooped up stakes in former indy darlings Peet’s, Intelligentsia, and Stumptown, along with Caribou, Krispy Kreme, and the Einstein/Noah’s bagel brands. While I spend a good chunk of my time writing about food and drinks, my day job is actually brand strategy consulting. I’ve worked with dozens of Fortune 500 companies on acquisition and innovation strategies, customer experience mapping, value proposition development, you name it. When a company is looking at acquiring another, the resulting brand portfolio should be among the most important considerations. Unfortunately, more often than not, the question of brand optimization is an afterthought to financial and operational considerations. Sure, assets like real estate and equipment are critical, as are capabilities like operational know-how and expertise. But understanding the nature of brand-customer relationships is where great acquisitions are made… will the acquired brand bring something new and complementary to the portfolio? Which of the brands in the new portfolio offer the best opportunities for future growth? Or, how readily will the acquired brand’s loyal customers move from the existing brand to the acquiring brand if pushed to do so? Go back to JAB Holdings, the big boy that bought up brands like Intelligentsia and Stumptown – brands that had built-in loyal fan bases. You’ll notice that JAB is now managing a portfolio of strong brands, and not trying to subsume acquired businesses under a single brand moniker. Intelligentsia and Stumptown are both known for high-quality sourcing and roasting, as well as for running effective retail shops – and while the argument could surely be made that continuing to invest in both brands is not the most efficient path to growth, both brands have equity that is worth building on. Killing one to favor the other would be a mistake, and JAB seems to know that. When a company makes an acquisition, that move always serves a larger purpose. Maybe they’re trying to expand into a new geography or product area, maybe they need intellectual capital or technology to take advantage of an emerging market opportunity, or maybe they are simply tasked with growing the top line. The very first thing to understand when looking at an acquisition is that larger purpose: what is the company trying to achieve? Octane is a homerun on points 1 and 2, and a solid at-bat on point 3. They’ve seamlessly blended beer and cocktails into their persona from day one, and they’ve established very strong relationships within Atlanta’s and Birmingham’s restaurant and food communities. Wholesale? Octane is there, and has shown success in the sourcing and roasting skills necessary to succeed, but nothing approaching the success of bigger players like Counter Culture or Batdorf & Bronson, who have become heavy hitters when it comes to the wholesale distribution side of the business. So, yes, the acquisition makes sense, but what about the question of branding? Isn’t point 2 above dependent on nurturing acquired brands rather than taking them out? Owen has said that they intend to phase out the Octane brand within 12 to 18 months. Simply put, I have a hard time seeing that as the right choice. Has Revelator thoroughly considered the existing equities of their own brand relative to the Octane brand? Have they done so through the lens of the intended target markets – both geographic and psychographic/demographic – that they hope to win with? If they have and have simply concluded that phasing out Octane is the way to go, good for them. But, at least in the Atlanta market, that sounds like a path to failure. Here, Octane has equity; Revelator has apathy and even (among many coffee industry insiders and fanatics) enmity. And there are plenty of competitors who have good relationships with the local community that Octane customers can jump to – think Spiller Park, Dancing Goats, Brash, Chattahoochee… I could go on. So, about Octane. For Revelator, my advice is this: think long and hard about which brand offers you the best chance for success – here in Atlanta, more broadly in the Southeast, and even on a national scale (if that’s what you’re after). Think about what you’re trying to build and the tools you now have at your disposal. Sure, there’s pride in the Revelator brand that you’ve begun to build over the past couple years, despite its ups and downs; but there’s a lot more than pride in the brand that Octane has built. There’s a community of loyal fans (myself included).